Taiwan’s government has reiterated its interest in the U.S.-made F-35B Joint Strike Fighter. 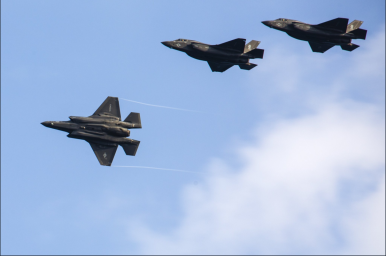 Taiwan has once more expressed its interest in procuring Lockheed Martin’s F-35 Lightning II Joint Strike Fighter for the Republic of China Air Force (ROCAF). Taiwan’s Minister of National Defense Yen Teh-fa told Taiwanese lawmakers during a meeting of the National Assembly’s Foreign Affairs and National Defense Committee that the F-35B, the U.S. Marine Corps’ short take-off and vertical landing (STOVL) variant of the supersonic fifth-generation fighter jet, matches the ROCAFs requirements. Even if some F-35s were to survive [an] initial [Chinese] onslaught, the aircraft would quickly be robbed of their necessary support infrastructure to continue operations. Consequently, should some F-35s manage to take off, it would likely be for a single sortie given the high probability that they would not have a functioning airbase to return to. Taiwan’s defense minister has recently reiterated his country’s interest in procuring the fifth-generation fighter jet from the United States.